Tamsin and Tyler married at a little old summer camp aptly named The Camp in Hendersonville, NC. It was a beautiful August day, The weather was an absolute dream and the light couldn't have been better in the little glen in the woods where they married. This British bride included many wonderful English touched to her wedding day, Wellington boots, a necklace made fro the china of on old teacup. For their romance session, We went many places over the grounds of the Camp. This image was taken under the boughs of a huge and very old oak tree, Under the tree, the light was shrouded and dark except for this beautiful ray of light coming in through a small break in the leaves. I love how the light barely touched anything but Tamsin. 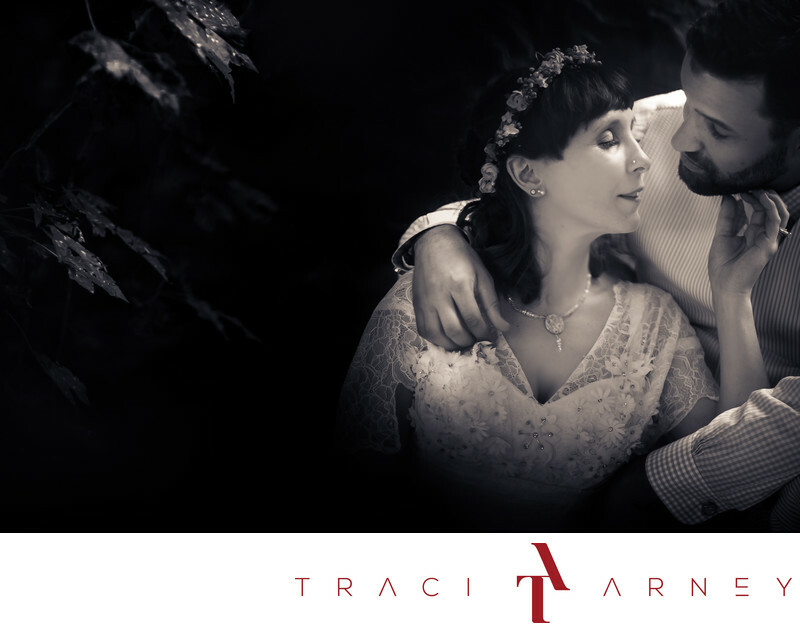 It's an intimate image that is about the quiet softness and intimacy of their relationship. Location: The Camp, 2420 Middlefork Rd, Hendersonville, NC 28792. Keywords: Asheville (102), British Wedding (3), Destination Wedding (186), Hendersonville (12), Outdoor (78), Romance Session (87), Tamsin (12), The Camp (12), Tyler (9), Wedding (465). 1/160; f/1.2; ISO 640; 85.0 mm.